One month after Typhoon Yolanda’s onslaught, the fate of millions is still in limbo. 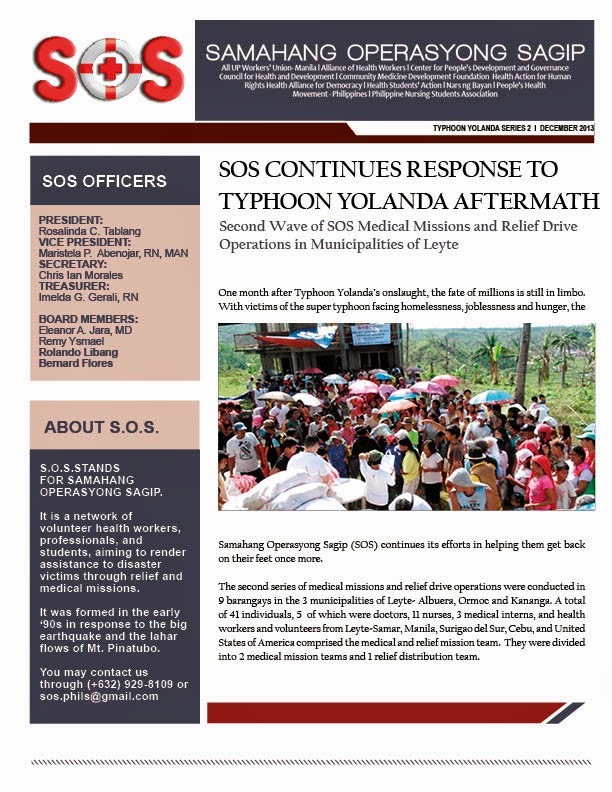 With victims of the super typhoon facing homelessness, joblessness and hunger, the Samahang Operasyong Sagip (SOS) continues its efforts in helping them get back on their feet once more. The second series of medical missions and relief drive operations were conducted in 9 barangays in the 3 municipalities of Leyte- Albuera, Ormoc and Kananga. A total of 41 individuals, 5 of which were doctors, 11 nurses, 3 medical interns, and health workers and volunteers from Leyte-Samar, Manila, Surigao del Sur, Cebu, and United States of America comprised the medical and relief mission team. They were divided into 2 medical mission teams and 1 relief distribution team. Families from far-flung areas outside the town centers ,who have received few or no relief assistance and medical mission since the typhoon, were chosen for the medical missions and relief drive operations. A total of 1,942 patients from Barangays Tinag-an, Antipolo and Mahayag in the Municipality of Albuera; Barangays Lunoy, Sto. Domingo and Natubgan in the Municipality of Kananga; and Barangay Ipil in Ormoc were served. Meanwhile, the relief drive operations benefitted 1,436 families from selected barangays in the towns of Albuera, Ormoc, and Kananga. They were able to receive relief packs, plastic sheets, building materials like nails, saw, hammers, cooking pots, and used clothes. Three water filtration pails were given to representatives of the three towns for use of the communities. The most common medical cases included upper respiratory tract infections, hypertension, wounds or injuries, skin infections, acute gastro enteritis, diarrheal diseases, tension headache and insomnia. 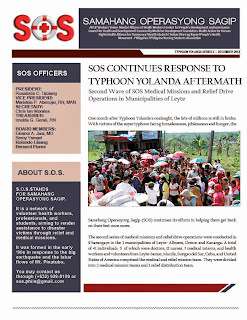 These ailments were also observed in the first wave of SOS medical missions in Eastern and Western Samar. The people in Tinag-an, Albuera requested for psychosocial assistance and tetanus toxoid for wounds sustained during the repairing and rebuilding of their homes. Major health risks which could lead to serious disease outbreaks were noted. These include the lack of potable water supply, as observed in Barangay Ipil, Ormoc; Lack of adequate and safe shelter and housing; Lack of electricity make night time pitch black and movement in the areas difficult and dangerous; Undernourished children, and; Presence of stagnant water and debris, which are breeding grounds for mosquitoes and other carriers of diseases. Most people in affected barangays have been trying to rebuild their homes and lives, yet many, especially those far from town centers, are still in dire need of assistance such as food, supplies and construction materials. It is pertinent that they be part of the planning and actual implementation in the relief and rehabilitation efforts so as to ensure relevance of relief efforts and medical services. 1. Government’s relief and medical assistance should include far-flung barangays. 2. Assistance for people to rebuild their homes and communities, through provision of construction materials including GI sheets, nails, hammer, saw, etc. For sale construction materials promoted by DTI could not be afforded by many especially those whose livelihood was affected. 3. Immediate and comprehensive health interventions to address potential sources of outbreaks and epidemics. These include immediate clearing of debris, provision of a safe water source, construction of shelter, assistance in food production and livelihood.